the "Depression of 1946" may be one of the most widely predicted events that never happened in American history. As the war was winding down, leading Keynesian economists of the day argued, as Alvin Hansen did, that "the government cannot just disband the Army, close down munitions factories, stop building ships, and remove all economic controls." After all, the belief was that the only thing that finally ended the Great Depression of the 1930s was the dramatic increase in government involvement in the economy. In fact, Hansen's advice went unheeded. Government canceled war contracts, and its spending fell from $84 billion in 1945 to under $30 billion in 1946. By 1947, the government was paying back its massive wartime debts by running a budget surplus of close to 6 percent of GDP. The military released around 10 million Americans back into civilian life. Most economic controls were lifted, and all were gone less than a year after V-J Day. In short, the economy underwent what the historian Jack Stokes Ballard refers to as the "shock of peace." From the economy's perspective, it was the "shock of de-stimulus." If the wartime government stimulus had ended the Great Depression, its winding down would certainly lead to its return. At least that was the consensus of almost every economic forecaster, government and private.... What happened? Labor markets adjusted quickly and efficiently once they were finally unfettered — neither the Hoover nor the Roosevelt administration gave labor markets a chance to adjust to economic shocks during the 1930s when dramatic labor market interventions (e.g., the National Industrial Recovery Act, the National Labor Relations Act, the Fair Labor Standards Act, among others) were pursued. Most economists today acknowledge that these interventionist polices extended the length and depth of the Great Depression. After the Second World War, unemployment rates, artificially low because of wartime conscription, rose a bit, but remained under 4.5 percent in the first three postwar years — below the long-run average rate of unemployment during the 20th century. Some workers voluntarily withdrew from the labor force, choosing to go to school or return to prewar duties as housewives. But, more importantly to the purpose here, many who lost government-supported jobs in the military or in munitions plants found employment as civilian industries expanded production — in fact civilian employment grew, on net, by over 4 million between 1945 and 1947 when so many pundits were predicting economic Armageddon. Household consumption, business investment, and net exports all boomed as government spending receded. The postwar era provides a classic illustration of how government spending "crowds out" private sector spending and how the economy can thrive when the government's shadow is dramatically reduced. Krugman says that experience teaches us that controlling spending would "deepen the slump" and cause tax revenues to fall. But the experience of 1945-47 is that a spending cut far deeper than we could dream of today -- from $84 billion to $30 billion! -- led to an economic boom. It's a timely sentiment, and we do indeed owe our lives and our pursuit of happiness to the freedom that America's soldiers have sometimes had to defend. But I wonder: Does Helprin think that all of America's wars have been necessary to American freedom? True, he doesn't allude to any of our wars since World War II in his list of hallowed places. But he does mention the Second Battle of the Marne, the great turning point of World War I and the first battle in which Americans started experiencing the enormous casualties that Europeans had been facing for nearly four years. The problem is that World War I was a catastrophe, a foolish and unnecessary war, a war of European potentates that both England and the United States could have stayed out of but that became indeed a World War, the Great War. In our own country the war gave us economic planning, conscription, nationalization of the railroads, a sedition act, confiscatory income tax rates, and prohibition. Internationally World War I and its conclusion led directly to the Bolshevik revolution, the rise of National Socialism, World War II, and the Cold War. World War I was the worst mistake of the 20th century, the mistake that set in motion all the tragedies of the century. The deaths of those who fell at the Marne are all the more tragic when we reflect that they did not in fact serve to protect our lives and all that we value. On this weekend we should mourn those who went to war, such as my father, who planned and participated in the liberation of Europe, and his brother who was lost off the coast of Normandy, and we should resolve not to risk American lives in the future except when our vital national interests are at stake. But Will doesn't take the cheap shot of dubbing the bill the RUSe Act. He left that for us. A ruse is "a wily subterfuge" or "a deceptive maneuver" -- a perfect description for this misleading bill offered in response to growing public concern over federal spending. State Rep. Raul Labrador walloped Republican establishment favorite Vaughn Ward in Idaho's 1st District congressional primary. Idaho native Sarah Palin campaigned for Ward, who had worked in the McCain presidential campaign in 2008. Labrador drew strong support from Tea Party activists. According to Politico, "Ward’s defeat also came despite his high-profile support from former Alaska Gov. Sarah Palin, who did more to assist Ward than she did for almost any other House candidate. Last Friday, she headlined a rally and fundraiser for Ward, and her parents and in-laws were supporters of Ward’s campaign." Lots of Republican incumbents lost their legislative seats, too, suggesting the continuing power of Tea Party activism and general populist unrest. But he, like his father, also knows well that a genuine libertarian impulse is astir in America.... polls show an uptick in both social permissiveness and skepticism of government intervention....[Ron Paul] has already waited a long time — and it appears the country is moving his way. "Thousands of police and soldiers swarmed into slums in Jamaica's capital Tuesday in search of an alleged drug kingpin wanted by the United States, trading gunfire with masked supporters of the fugitive," the Washington Post reports. "At least 30 people, mostly civilians, have been reported killed since the battle erupted Sunday." Later reports put the number of deaths at 44. And for what? [Christopher] Coke, who allegedly assumed leadership of the "Shadow Posse" from his father, was accused in a U.S. indictment in August of heading an international trafficking ring that sells marijuana and crack cocaine in the New York area and elsewhere. Forced to name the “craziest” policy favored by American politicians, I’d say the multibillion-dollar war on drugs, which no one thinks is winnable. Asked about the most “extreme,” I’d cite the invasion of Iraq, a war of choice that has cost many billions of dollars and countless innocent lives. The “kookiest” policy is arguably farm subsidies for corn, sugar, and tobacco—products that people ought to consume less, not more. These are contentious judgments. I hardly expect the news media to denigrate the policies I’ve named, nor do I expect their Republican and Democratic supporters to be labeled crazy, kooky, or extreme. These disparaging descriptors are never applied to America’s policy establishment, even when it is proved ruinously wrong, whereas politicians who don’t fit the mainstream Democratic or Republican mode, such as libertarians, are mocked almost reflexively in these terms, if they are covered at all. Friedersdorf goes on to declare that Rand Paul's views on the gold standard and his doubts about the Civil Rights Act are "wacky." (Without refighting the civil rights argument, I'll note that some economists would disagree with Friedersdorf about the gold standard.) But, he concludes, "crazy, kooky, extreme actions are perpetrated by establishment centrists far more often than by marginalized libertarians." Look no further than Jamaica. The publication of a primer on libertarianism in Italy is another sign of two heartening developments: the continuing process of the world's people being drawn closer together, and the worldwide spread of the ideas of peace and freedom after a century of war and statism. This book may seem to be reaching Italy at an inopportune moment, a time when people from the president of France to Nobel Prize-winning economists are proclaiming that “laissez-faire is finished.” One American pundit of the center-left even exulted in “the end of libertarianism.” These critics are short-sighted. The idea of libertarianism, of liberty under law, is needed now more than ever.... Libertarianism is sometimes perceived as a radical philosophy. And in some ways it is: It rejects and has fought in turn absolutism, communism, fascism, national socialism, corporate statism, theocracy, and every form of tyranny over the mind of man. Libertarians advance a radical and consistent vision of individual rights and strictly limited government that would eliminate the great bulk of the modern state, even in mixed-economy democracies. 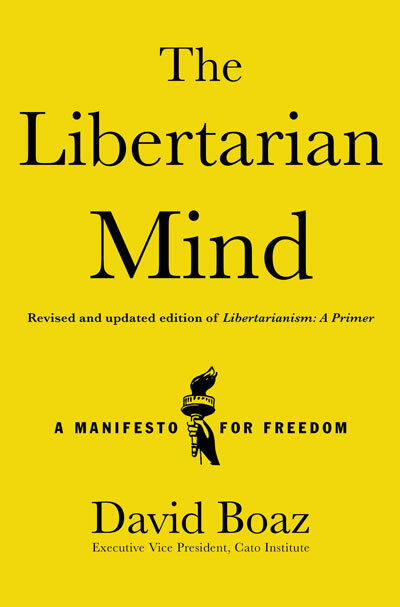 But in a broader sense libertarianism is the fundamental philosophy of the modern world: liberty, equality, enterprise, the rule of law, constitutional government. These ideas have become so commonplace that we forget how radical they were at one time. Libertarians want to apply those principles more consistently than do the adherents of other ideologies. But few people in the modern world would want to reject libertarian ideas wholesale. The largest trends in the world reflect libertarian values. Communism is virtually gone, and few people still defend state socialism. Eastern Europe is struggling to achieve societies based on property rights, markets, and the rule of law. Honest observers throughout the developed world understand that the middle-class welfare states are unsustainable and will have to be radically reformed. The information revolution is empowering individuals and small groups and undermining the authority of centralized power. Perhaps most importantly, the increasing globalization of the world economy means that countries that want to prosper will have to adopt a decentralized, deregulated, market-oriented economic model. You can't avoid world markets in the 21st century; or if you do, you will be left out of the phenomenal economic growth that global markets and technological development will deliver. So one reason that Italian readers should be interested in libertarianism is very simple and practical: these are the ideas that drive the modern world, and you need to know about them. The other reason is that libertarianism offers to every country the promise of peace, economic growth, and social harmony. I hope Italian readers will join libertarians around the world in working to restrain state power and liberate individuals, families, associations, and enterprises. David Boaz, executive vice president of the libertarian Cato Institute, said that in many ways Americans are freer now than they were in any pre-1937 libertarian Halcyon day. Women and black citizens can vote, work and own property. "Micro-regulations" that existed before the Supreme Court shift, which controlled trucking, civil aviation and other private pursuits, are gone. "Sometimes he talks the way libertarians talk in political seminars," Mr. Boaz said of Mr. Paul. "There are not really many people who want to reverse Wickard, but there are many professors who could make a good case for it." Whenever a reporter takes a few sentences from an interview, some context is going to be lost. These quotations are accurate, but let me add some context. For a discussion of my view that we have not in fact followed a road to serfdom from a libertarian golden age, check out these blog posts and articles, as well as my book The Politics of Freedom. When I said that Rand Paul "talks the way libertarians talk in political seminars" -- and I should have said "philosophy seminars" -- I was trying to make a distinction between the kinds of ideas that are commonly debated in classrooms and think tank seminars and those that are relevant to any particular political campaign. And my statement that there aren't "many people who want to reverse Wickard" was in the context of a discussion about the tens of millions of Americans who believe in less government and more freedom, as noted here and here and here and, classically, here. I made the point that there were two great libertarian shifts in American politics and culture in my lifetime, the cultural/civil rights/women's revolution of the Sixties and the entrepreneurial/economic/taxcutting revolution of the Eighties, and few people want to return either to the cultural strictures of the 1950s or the tax rates of the 1970s. And in that sense there's a broadly libertarian center in American politics, and some of those people reacted against the excessive social conservatism (not to mention the over-spending and the endless wars) of the Bush Republicans in 2008, and are now reacting against the excessive statism of the Obama administration. But of course they're not all as libertarian as I am, and not many normal people would recognize the term "Wickard v. Filburn," much less call for its reversal. (On the other hand, pollsters should try asking voters, "Do you think the federal government should be able to tell a farmer what crops he can grow on his own farm for his own use?" I'll bet more people would side with Rand Paul than with, say, the New York Times.) When Rand Paul gets back to talking about bailouts, deficits, debt, and Obamacare, he's going to be appealing to many of those voters. And if his opponent accuses him of supporting medical marijuana, he'll find that 81 percent of Americans agree. Sixty percent of Americans oppose federal mandatory minimum sentences for nonviolent crimes, as Rand Paul does. Paul has every likelihood of appealing to a broad swath of Americans who are broadly libertarian. Nothing is so essential to the preservation of a republican government as a periodical rotation. Nothing so strongly impels a man to regard the interest of his constituents, as the certainty of returning to the general mass of the people, from whence he was taken, where he must participate in their burdens. It looks like the voters intend to rotate a lot of politicians out of office this year. But why should it take trillions of dollars of debt and millions of dollars of campaign spending to get some new thinking in Congress? Why not make rotation in office the law? A government is a set of institutions through which we adjudicate our disputes, defend our rights, and provide for certain common needs. It derives its authority, at some level and in some way, from the consent of the governed... What we want is a limited government that attends to its necessary and proper functions... Thus libertarians are not “anti-government.” Libertarians support limited, constitutional government — limited not just in size but, of far greater importance, in the scope of its powers. What does "anti-government" mean? We're hearing about "anti-government" protests in Greece. But as George Will says, "Athens' 'anti-government mobs' have been composed mostly of government employees going berserk about threats to their entitlements." The anti-government protesters in Bangkok appear to be opposed to the current prime minister, protesting to bring back the former prime minister. And then there are the "anarchists" who protest government budget cuts. But none of those have anything to do with American libertarians. Michael Gerson should withdraw his false charge and debate the role of government honestly with libertarians who believe in limited government and oppose the vast expansions of government that he provided the arguments for.